All road and rail links between occupied France and Vichy cut by the Germans. Slovak President and Premier meet Hitler and von Ribbentrop at Berchtesgarden. Act of Havana is signed by the US and twenty Latin American countries, agreeing to help any country threatened by the Axis in the Americas. Finland ends diplomatic relations with Great Britain. German troops begin to clear Soviet forces trapped in the Smolensk pocket. Forty thousand Japanese troops land in southern French Indochina. The effect of the fall of Rostov spreads panic and terror in the Soviet Union, prompting harsh counter-measures byÂ the Soviet High Command. Young Jews in Warsaw ghetto form Jewish Fighting Organization (ZOB). The second mass raid on Hamburg by 722 RAF bombers results in nine square miles of city being set alight. The Japanese garrison of 6,000 troops are secretly evacuated from Kiska in the Aleutians. President Roosevelt announces end of coffee rationing. In Sicily, Palermo Harbor opens for Allied shipping. U.S. troops take Coutances, thereby meeting the objectives laid down for ‘Operation Cobra’. Brest-Litovsk, on the Polish frontier is taken by the Russians. More crossings over the Vistula are also made. 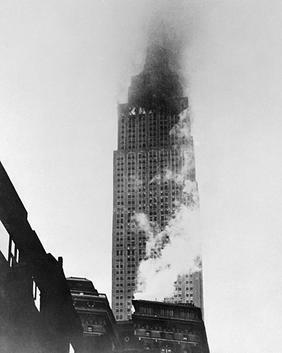 A B-25 bomber crashes into the Empire State Building at 79th floor in fog, killing 14 people. Japanese “choose to ignore” Potsdam Declaration requiring unconditional surrender. The remnants of Japanese battle fleet are destroyed in three days of attacks over the Japanese Inland Sea, as the Americans deploy 2,000 carrier-planes and bombers in action. Destroyer USS Callaghan is sunk, the last Allied ship to be sunk by kamikaze. US Senate ratifies UN Charter.